Update 4: A UN Security Council meeting has been called for 11am tomorrow after Ukraine incident with Russia, US Ambassador to the UN Nikki Haley said in a tweet. Update 3: according to media reports, on Monday Ukraine's president will propose imposing military law, amid the ongoing crisis with Russia. Ukraine's government is requesting vote on imposition of martial law for 60 days, it has yet to be voted on to be implemented and has not been implemented or made official until after vote and it is approved. Update 1: Following reports from the Ukraine navy that Russian ships had fired on Ukraine vessels near the Kerch Strait, Ukraine accused Moscow of also illegally seizing three of its naval ships - the “Berdyansʹk” and “Nikopolʹ” Gurza-class small armored artillery boats and a raid tug A-947 “Jani Kapu” - off Crimea on Sunday after opening fire on them, a charge that if confirmed could ignite a dangerous new crisis between the two countries. Meanwhile, Ukrainian President Petro Poroshenko immediately called a meeting with his top military and security chiefs to discuss the situation. "NATO is closely monitoring developments in the Azov Sea and the Kerch Strait, and we are in contact with the Ukrainian authorities. We call for restraint and de-escalation. NATO fully supports Ukraine's sovereignty and its territorial integrity, including its navigational rights in its territorial waters. We call on Russia to ensure unhindered access to Ukrainian ports in the Azov Sea, in accordance with international law. At the Brussels Summit in July, NATO leaders expressed their support to Ukraine, and made clear that Russia's ongoing militarisation of Crimea, the Black Sea, and the Azov Sea pose further threats to Ukraine's independence and undermines the stability of the broader region." Finally, Ukraine has called for an urgent UN Security Council meeting over 'Russian aggression' while Ukraine's secretary for national security, Oleksander Turchynov, accused Russia of engaging in an act of war: "We heard reports on incident and have concluded that it was an act of war by Russian Federation against Ukraine"
As we detailed earlier, the Ukrainian navy has accused Russia of opening fire on some of its ships in the Black Sea, striking one vessel, and wounding a crew member. In a statement on its Facebook page, the Ukrainian navy said the Russian military vessels opened fire on Ukrainian warships after they had left the 12-mile zone near the Kerch Strait, leaving one man wounded, and one Ukrainian vessel damaged and immobilized, adding that Russian warships "shoot to kill." Ukraine accused a Russian coastguard vessel, named the Don, of ramming one of its tugboats in "openly aggressive actions". 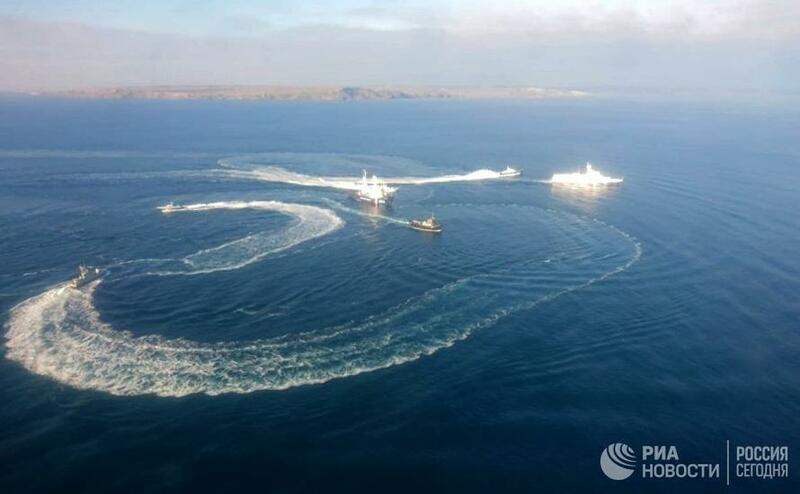 The incident allegedly took place as three Ukrainian navy boats - including two small warships - headed for the port of Mariupol in the Sea of Azov, an area of heightened tensions between the countries. Russia accused Ukraine of illegally entering the area and deliberately provoking a conflict. Sky News reports that the Ukrainian president has called an emergency session of his war cabinet in response to the incident. "Today's dangerous events in the Azov Sea testify that a new front of [Russian] aggression is open," Ukrainian foreign ministry spokeswoman Mariana Betsa said. "Ukraine [is] calling now for emergency meeting of United Nations Security Council." It comes after a day of rising tensions off the coast of Crimea, and especially around the Kerch Strait, which separates Crimea from mainland Russia after Ukrainian vessels allegedly violated the Russian border. The passage was blocked by a cargo ship and fighter jets were scrambled. According to RT, Russia has stopped all navigation through the waterway using the cargo ship shown above. 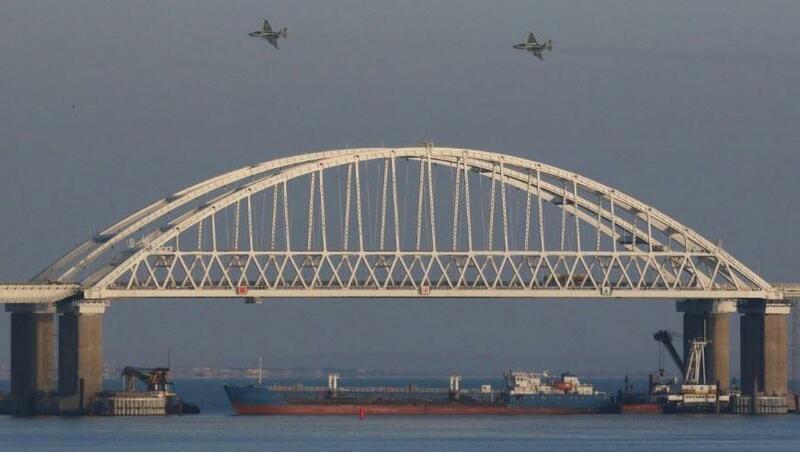 Videos from the scene released by the Russian media show a large bulk freighter accompanied by two Russian military boats standing under the arch of the Crimea Bridge and blocking the only passage through the strait. Russian Air Force Su-25 strike fighters were also scrambled to provide additional security for the strait as the situation remains tense. The move came as five Ukrainian Navy ships had been approaching the strait from two different sides. According to RT, two Ukrainian artillery boats and a tugboat initially approached the strait from the Black Sea while “undertaking dangerous maneuvers” and "defying the lawful orders of the Russian border guards." Later, they were joined by two more military vessels that departed from a Ukrainian Azov Sea port of Berdyansk sailing to the strait from the other side. The Russian federal security agency FSB, which is responsible for maintaining the country’s borders, denounced the actions of the Ukrainian ships as a provocation, adding that they could create a “conflict situation” in the region. According to the Russian media reports, the Ukrainian vessels are still sailing towards the strait, ignoring the warnings of the Russian border guards. According to Reuters, a bilateral treaty gives both countries the right to use the sea, which lies between them and is linked by the narrow Kerch Strait to the Black Sea. Moscow is able to control access between the Sea of Azov and the Black Sea after it built a bridge that straddles the Kerch Strait between Crimea and southern Russia. Reuters adds that tensions surfaced on Sunday after Russia tried to intercept three Ukrainian ships — two small armored artillery vessels and a tug boat — in the Black Sea, accusing them of illegally entering Russian territorial waters. The Ukrainian navy said a Russian border guard vessel had rammed the tug boat, damaging it in an incident it said showed Russia was behaving aggressively and illegally. It said its vessels had every right to be where they were and that the ships had been en route from the Black Sea port of Odessa to Mariupol, a journey that requires them to go through the Kerch Strait. Meanwhile, Russia’s border guard service accused Ukraine of not informing it in advance of the journey, something Kiev denied, and said the Ukrainian ships had been maneuvering dangerously and ignoring its instructions with the aim of stirring up tensions. It pledged to end to what it described as Ukraine’s “provocative actions”, while Russian politicians lined up to denounce Kiev, saying the incident looked like a calculated attempt by President Petro Poroshenko to increase his popularity ahead of an election next year. Ukraine’s foreign ministry said in a statement it wanted a clear response to the incident from the international community. Both countries have accused each other of harassing each other’s shipping in Sea of Azov in the past and the U.S. State Department in August said Russia’s actions looked designed to destabilize Ukraine, which has two major industrial ports there.